Binocular vision can help you see things at a distance - like a play, a baseball game or your grandchild's concert. 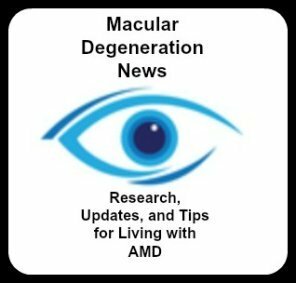 While macular degeneration magnifiers are helpful to see things close up, you will also need vision aids for macular degeneration that will allow you to see at a distance. You will find that through binocular vision you can once again enjoy seeing things or people from far away. Just like the magnifiers, the type of telescopic device you buy depends on what task you want to use it for. Telescopes magnify an image that is far away so that you can recognize a face or watch a movie. √ Do you need your hands free? √ How wide does the field of vision need to be? √ How easy is it to focus? You may need several devices to meet your different needs for binocular vision. A handheld telescope works good when distance viewing is needed for a quick look at a street sign, a bus number, or a store front. A prescription may be required, as well as special training from a low vision specialist. When a miniature telescope is attached to the top of a pair of eyeglasses it is called a bioptic telescope. By just tilting your head down, you can switch you sight between your "regular vision" and the magnified vision through the telescope. It is fast and convenient to do. If you are wanting to just see the TV better or watch a movie, sporting or cultural event, the best glasses are those that sit on your nose or clip onto your glasses. This type of telescope is hands free so that you are not holding up a pair of binoculars for a long time. These types of macular degeneration glasses come in different powers just like other magnifiers. The lowest power is usually 2X but they go up to 10X. Most people will start with a 3X - 4X. The weaker the magnification the wider the field of view. The stronger the magnification the smaller the field of view. A stronger magnifier may allow you to see fine details better, but will give you a smaller viewing field. √ how easy they are to focus. 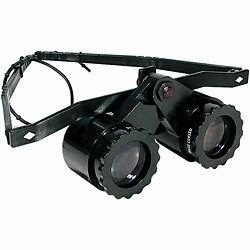 It is best to talk to your low vision specialist who can recommend the best binocular magnifier for your vision. The trouble with buying this type of low vision magnifier on the internet, is that you can't try them until you've bought them. That's why it is best to find a low vision specialist who can recommend the right power and style for you depending on what function you want to use them for.